Use of CMS or Framework: It must be the step one for the websites to have a better image. I sense either they are using a home grown CMS (Content Management System) or a self coded, self made system. Rather than that using a Framework based on MVC (Model View Controller) like CodeIgniter will help them a great deal in management and long term expandability of the websites. 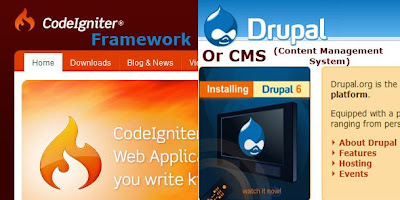 A CMS like Drupal or any other can also be used to manage the contents in a far effective and efficient way. Using a CMS will enable various facilities and add-on for a simple example changing the look and feel (theme/template/skin) will be very pain less. XHTML/CSS Table-less design: They say table is to show tabular data like no. , name, post in a table looks good but website layouts should be in XHTML/CSS. 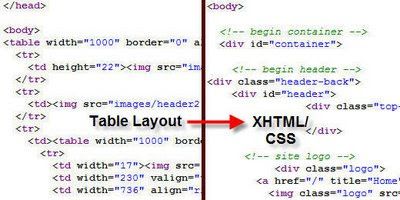 As mentioned earlier there are various reasons to use XHTML/CSS, mainly it is used to save bandwidth, get clarity in code to point some out. So with use of this tried and tested standard that has become the de facto in modern 2.0 web design and development the Top 7 websites can benefit a lot. Not only XHTML/CCS layout if they can build fluid or even fixed layout targeting 1024*768 px and similar larger resolution than 800*600 px resolution we could see the site in a better way. 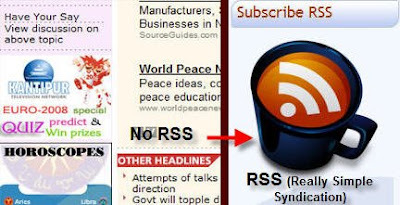 RSS: Stands for Really Simple Syndication. Wikipedia here defines “RSS is a family of Web feed formats used to publish frequently updated works – such as blog entries, news headlines, audio, and video – in a standardized format.” Simply, RSS let’s the subscribers know about a website’s update as soon as it happens in their RSS reader. Some of the top 7 Nepali websites may not need it but Nepal News and E-Kantipur are in acute need of RSS in my view. If I can get the News in my reader, be it headline only as soon as its posted it will be great. So RSS should be a major feature the sites should upgrade to. It will also open doors to socialize web and be the key starting point in the website going web 2.0. Standard Compliant HTML and SEO: Sorry to state but the HTML used in the websites without proper styling and following global standards are not promising. As stated in earlier post the Facebook parser does not get the HTML so it yields unpredictable output when you add the link. I believe with use of out of standard HTML itself the SEO (Search Engine Optimization) of the website will be hampered. Some site have OK URLs but some have very bad URL with search engine in the mind. Here also the sites can upgrade to better than what they are doing now. Socialize: You might think how can websites socialize. I guess all the 7 Top websites depend very heavily on Direct Traffic rather than search engine traffic and referring websites. If they follow good SEO these sites will get more traffic from the search engines. Another thing these wesbites can do is open up Facebook groups for the sites which will compliment the website. I would certainly join a THT (The Himalayan Times) facebook group or be a fan of THT page. Twitter updates about the website can also be great but it will be easier if these sites have RSS first. Sites like BBC and CNN tweet their stories then why not us. 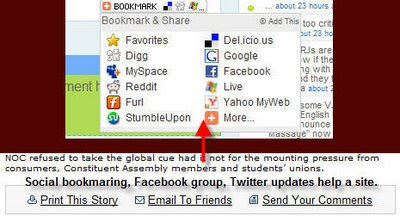 In this regard, these sites can put “bookmark this” or ”Add this” button on the content to widen the audience via use of Social bookmarking websites. These sites will surely get more traffic by this method. One thing common on almost all these sites is “Ad Sense” misplaced, very obstructive and annoying at times. They can place them in a better way I guess and other advertisement can also be put in a subtle way. I’d also suggest some good graphical interface with gradients and Web 2.0 feel in it. If they get more traffic by following above suggestion they can surely boost their earnings. I assume these suggestion are applicable to all the sites that don’t follow current standards and trends :-). Hope this post and its contents are viewed by one of the top 7 sites and they mend their ways. If not they keep this in mind and the next site they develop make use of these easy and free factors for heightened success. Really hope light of Tihar enlightens the minds of the developers of the TOP 7 Nepali websites. « Why is Google atop everywhere?